Looking for the Wilkerson website? Click here. 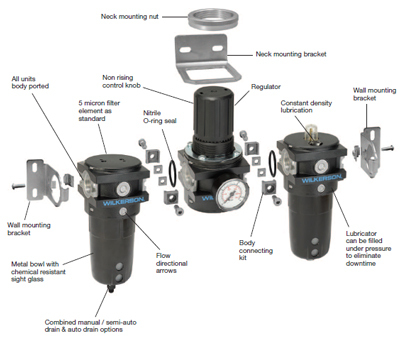 For use in applications that require reliable performance and accurate pressure control. This type of regulator is generally used for material handling systems, flow and temperature controllers, critical air control circuits, medical and scientific test equip-ment, and valve positioners. For the removal of solid particle contaminants down to 5 microns and the separation of bulk liquids. 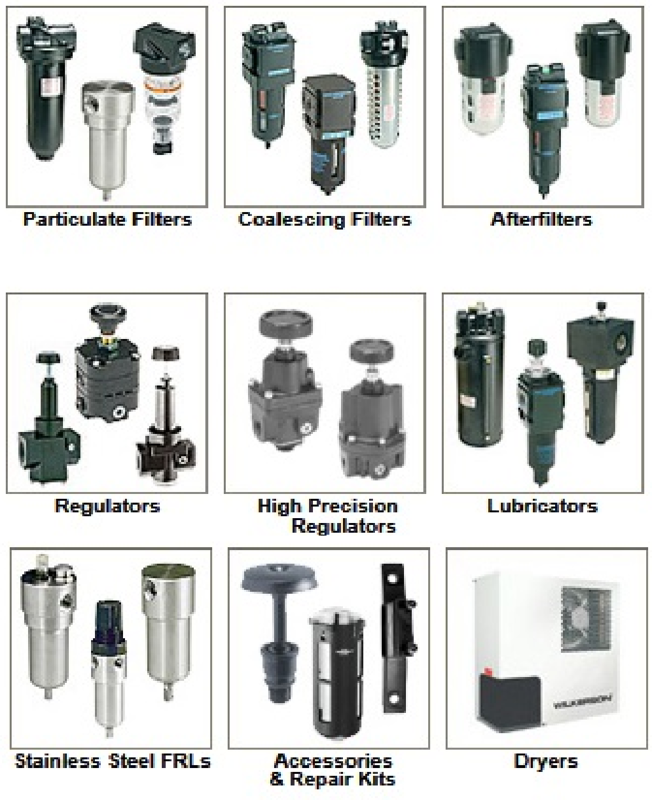 This type of filter is generally used in industrial applications where liquid water and oil, and harmful dirt particles must be removed from the compressed air system. Protection of components such as air valves, cylinders, as well as air conveyors, air gaging, air bearings, air control circuits and paint spraying equipment are examples of specific end-use applications. This grade of filter element should be used as a prefilter for the Grade C coalescing filter. Air line lubricators are specifically designed to generate and introduce an oil aerosol (mist) into the compressed air flow. The air flow then carries the oil to the pneumatic devices where the lubricant mist coats the moving and sliding surfaces thus reducing friction and wear.